Grayling Marine International, Inc. and Peregrine Marine International, Inc. built the M/V Peregrine in 1990. Her Length Overall is 90 ', with Beam of 24', and Depth 8' 3", Drafting 42" and is 100 gross tons. 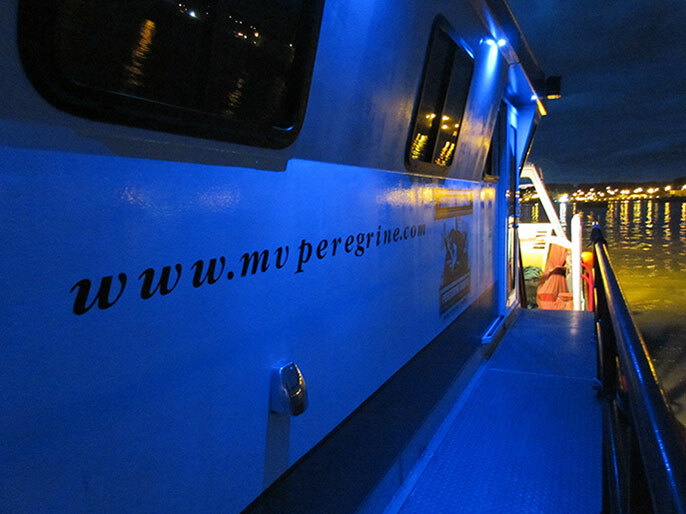 The M/V Peregrine is an all aluminum plate constructed landing craft style vessel. She has a semi-v bottom square transom stern and a raked bow with a bow gate that hydraulically raises with cable and pulley operations from port and starboard sides. The vessel is designed with a reverse chine, gull wing design to a square chine, straight sides with raised, compartmental bulwarks to port and starboard sides, and small bow compartments forward at the bow gate. OAL: 90' BEAM: 24' DRAFT: 42"
Bow Gate/Winches: Bow Gate is 15' 6" wide, all aluminum 5086 construction with non-skid applications, and aluminum pipe safety rails around the entire bow compartment and gate area. 1-Hydraulic Winch, 2-Ramsey hydraulic, maximum line pull 8000 lbs (top wrap). Aft Work Deck Area: 22' long x 19' wide. Cargo Deck: 33' x 20' x 6' x 10' = 720 sq ft of usable space – 50 Ton Capacity. Under Cab Deck Area: 27’ Long x 10’ 6” Wide x 8’ height. Deck: ll decks are aluminum star plate aft walkways or plate construction with non-skid applications on stairs and lower cargo decks. Forward bow deck and main weather deck are aluminum plate construction. Experience: The M/V Peregrine and crew has an excellent safety and environmental record working for Western Geophysical, Northern Geophysical, Fairweather Geophysical, BP Phillips, Arctic Geophysical Science, SAExploration, Shell, Conoco-Phillips, Global Diving, American Marine, IT Telecom, GCI, Furgo GeoSerivices, Inc., Terrasond, and Veritas. The M/V Peregrine has worked in the seismic field in Cook Inlet and Prudhoe Bay as a shallow water cable boat, air gun boat and streamer boat. Captain Jeff Johnson has 22 years experience working Cook Inlet and 13 years experience in Prudhoe Bay and is very familiar with extreme tides, shallow water, and working around ice in shallow water. Other work experience includes oil spill response, freight hauling, tendering, fiber optic cable deployment, diver support vessel, and seal surveys for NOAA. 3-Cummins 2006 QSL9, 405 HP, 6 cylinder, diesel engine. 12 V DC start. See photos of our vessels in action. Copyright © Peregrine Falcon Alaska LLC. All rights reserved. Website by Sundog Media LLC.